Despite the film’s title, production for The Guernsey Literary and Potato Peel Pie Society combined locations in London, Bristol and Devon for its 1940s setting. The county of Devon was used to double for the film’s titular island which saw itself under Nazi occupation for the majority of the Second World War. Scenes of Nazi soldiers marching through the streets of Guernsey were actually filmed in the town of Bideford. 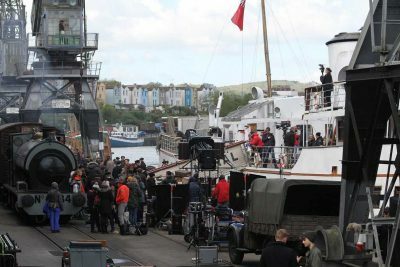 Over in Bristol, Princes Wharf required little dressing to portray a 1940s harbour. For the London portion of the shoot, 60 members of cast and crew descended on Sicilian Avenue, and with the help of green-screen effects, transformed the location into a traditional street scene of the era. The House off Detention in Sans Walk was also used as the setting for a jazz party. FilmFixer provided location assistance for these scenes. The UK provides a 25% tax rebate for feature films that spend at least 10% of their budget in the country. The incentive has attracted major cinematic blockbusters including Ready Player One and the upcoming sequel to Spider-Man: Homecoming.